Charcounter is a useful webapp that can easily count the words, characters in your desired text. 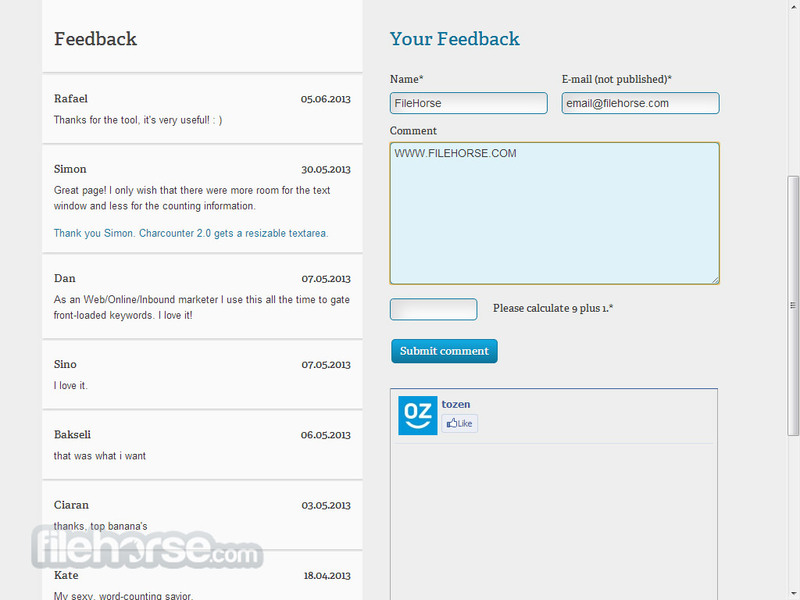 Simply input the text of your choice in the text box on the main page of http://www.charcounter.com/ and you will immediately get information about number of words and inserted characters (with or without empty spaces). This easy and convenient app has no cumbersome interface, and can be accessed and used easily not only from PC and Mac, but also from mobile phones and tablets. Character and Word Counter! Simple and useful browser-based character and word counter! Charcounter is a simple web application that allows anyone who has a modern browser to easily find out more details about text they either wish to create directly on the Charcounter website or for text that they have taken from other source. By simply typing or pasting text on main text box on Charcounter, users can instantly find out 4 main stats – number of characters, number of words, characters without white space and number of paragraphs. This is especially important for people who want to observe their stats directly while they are typing text live on Charcounter, enabling them to craft text or modify old one by seeing in real-time how their edits are impacting the character or word count. Character and Word Counter! Even though Charcounter does not offer a particularly significant service that can impact everyone, web designers or people who need to deliver texts that are of a very particular size can easily use this app to modify their texts, see counters change in real-time while there are managing their edits, and help them to very easily to craft text that will have appropriate form that was demanded by employees, school teachers or design constraints. It is true that all modern professional text editors have integrated tools or counting words and characters same as Charcounter, but when you are on the go and have access only to random computer or portable device that is not populated with your own productivity applications, then Charcounter can be extremely helpful.